I still have to replace a few of the colorful patch cables. I ran out of George L's right-angle plugs. 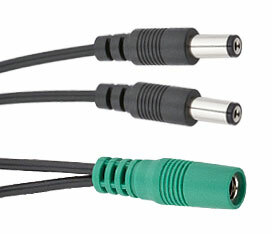 I also need to solder up 2 custom MIDI cables using the Switchcraft Right-Angle plugs. All of this (including the M9 and H9) are being powered by a PP-Mondo. My custom pedalboard panel arrived yesterday. I'm using the Redco locking 1/4" pass-thru jacks. Still waiting for my MIDI pass-thru from Temple Audio. That's a Pedal Power MONDO on the right side. Last edited by stilwel on Tue Apr 07, 2015 11:38 am, edited 1 time in total. where did you get the backplate and ¼ inch plug?? I designed the plate and had it fabricated. The 1/4" pass-thru plugs are from Redco. do you have one to sell? Hey man! Really need your help, have you powered a line 6 m9 by using a voodoo lab 4x4 using the current double adapter? does it work? Corygaff wrote: Hey man! Really need your help, have you powered a line 6 m9 by using a voodoo lab 4x4 using the current double adapter? does it work? I'm using a Mondo, but you should be able to do the same with the 4x4. I use the current doubling cable connected to both 12Vdc 400mA outputs and it works GREAT with the M9. Done. I finally got all of my Right-Angle MIDI plugs yesterday and finished wiring it up this morning. Labels on PX-8 show the actual signal path. Giggity - makes a fantastic base tone on which to layer Fuzz boxes. Tech 21 MIDI Mouse - Super-basic MIDI pedal to select presets on the PX-8, M9 and H9. One stomp and the entire board is reconfigured. The MM is phantom powered by the PX-8. FF Mini (Silicon) - Great sound in a small package. This will will rotated out occasionally for my Tweak Fuzz. Fender FWP-1 Wah - First in the signal path and basically a Crybaby, but with an internally switchable output buffer so it plays nice with my Fuzz Pedals. I've modded this to have a 6-way frequency range switch and toe frequency pot (similar to the Dunlop AIC wah). See pic below.